This is a large snake, exceeding 6 feet in length, having a very potent neurotoxic, venom. Kraits are ground snakes and vary drastically in temperament. The Blue Krait is nervous and aggressive, but the Banded Krait is a very quiet animal that, in captivity, usually will not bite, in the field, it bites only at night. 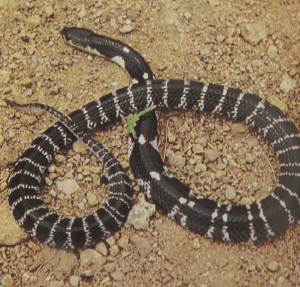 Banded Kraits will sometimes take rodents but prefer other snakes. The venom of some species contains effective nerve poisons including specific compounds that act upon the connections (motor end plates) of nerves to the muscles of the diaphragm, in the Banded Krait the venom is extremely viscous so that it apparently must be introduced into the prey by a slow chewing action, but because of its potency, not much needs to be injected to be highly effective.